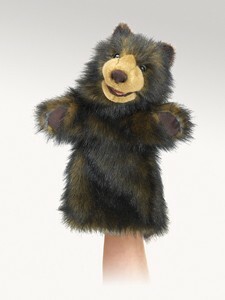 Folkmanis 2986 - Perform your own version of a Winter's Tale with the Stage Bear puppet. Black and brown fur with movable mouth and arms for dramatic appeal, Shakespeare would surely approve! Movable mouth and forepaws. Stage puppet measures 6” x 8” x 15”.